Users looking to make their daily routines much easier to manage, should visit Wrike, an online software for project management that is utilised by high-performance teams and productivity experts around the globe. Wrike’s project management tools and features make it easier to manage tasks and projects so that teamwork and collaboration become efficient. Additionally, Wrike gives you more visibility around who does what, when tasks are due, and how each task fits into the larger picture. The company was established in 2007 with headquarters in Mountain View California. Wrike has been acknowledged by San Francisco Business Times/Silicon Valley Business Journal as one of the Best Places to Work as well as one of the Top 100 Workplaces in 2015, by the Bay Area News Group. Translated into 10 languages, Wrike is used in 120 countries and in 2014 was also awarded Cool Vendor status by Gartner. Being an online project management software, it provides complete visibility together with control over all tasks that must be performed. With the support of the software, project management gets easier. Wrike becomes the control point in coordinating efforts with the rest of the business. Their project management tools include being able to organize tasks into folders, time tracking, an interactive timeline, communication and feedback on the tasks themselves, and online collaboration features for teams of any size. The main purpose of the software is to assist in optimizing your workflow and enabling your company to focus on fundamental tasks. There are useful features for marketing and creative teams in the form of proofing and approval, resource and workload management, document versioning, project templates, time tracking and budgeting, together with visual dashboards and reporting. You can organize your project any which way you please and complete it all in one place. 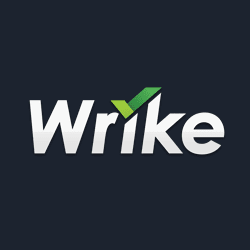 Wrike also has mobile apps for both Android and iOS devices. With the native Android app, you can work on your tasks with ease, no matter where you are. The Wrike Android app tends to provide much more convenience and efficient project management functions. The new app has a heightened user experience that makes creating, editing, scheduling, and discussing tasks while on-the-go so much easier. The recently released mobile dashboard also provides an overview of your important tasks within seconds. With the mobile app for iOS, one can log ideas, update tasks, or leave feedback while on the go. It almost takes away the need to open a laptop since your mobile device can easily accomplish most of the work that needs doing. More importantly, your mobile is always at handm, making important details readily available at your fingertips. With Wrike, one can synchronize a team’s efforts, keep the project on the track and get additional tasks performed together in the cloud. It is an ideal real-time workspace where one can find the team collaborating in order to get tasks done with precision and efficiency. With Wrike, productive performance of every team member can be amplified, regardless of where they may be located in the world. No matter what your workflow looks like, Wrike can help improve communication and clarity as well as accountability in accomplishing the the parts of any project.